Home&Breakfast: enjoy the privacy of a private rental and let our staff spoil you. Gorgeous breakfast and daily cleaning included. Let this be your stay in Marrakesh! experience the calm and peaceful lifestyle, which has been lost, long time ago, in all modern societies. The riad will be all for you and will welcome you among its stylish tadelakt walls, inlaid woods decorations, wrought iron, mosaics and traditional motifs, which we have enjoyed decorating with playful colours. We decided to keep the original structure to allow our guest to live an authentic experience. The whole riad will be at your disposal! You will find 5 rooms, each with private bathroom. The cool patio, the silent and elegant hub of the riad, is the ideal setting to relax, read a book, or refresh in the pool after a tour in the medina. The terrace, where you can sunbathe, or relax in the shadow of the pergola drinking a freshly squeezed orange juice, or have a dinner under the stars... The hammam, an absolutely amazing experience! Enjoy it with the other treatments we offer, and we will organize a deep relax moment all for you!Furthermore, there is a bhou (living rooms) with fireplace, SAT TV, HIFI with USB Key for your music..
During the day Oussama is at your disposal for any information you need and Noura will deal with your breakfast and possible meals. They will always respect your privacy, but they are always there if you need something. I am always reachable by message or phone if you need to contact me. We can arrange transfer from to the airport, dinners and private parties, hamma & SPA, city guided tours, daily trips in the surroundings of Marrakech (Essaouira, Ourika valley, Ouzoud waterfalls, Ouarzazate and the Agafay desert and lake Lalla Takerkoust), camel, quad and sidecar rides, ballooning, and much more. Do not hesitate to ask! 2 years ago during a trip to Morocco, I felt in love with Marrakech and its magic, and now I’m very happy to have the possibility to host other people coming here to visit this wonderful land. There is a washing machine. Ask Noura if you need it. There are 2 fireplaces in the riad. It is not allowed to light them up by yourself. In the case, ask Oussama, who will do it for you. KITCHEN ACCES: it’s allowed only to take drinks from the cooler. It’s forbidden to use the gaz. The riad is rented with the formula Home & Breakfast: private rent (no other guest) with staff and service available during the day. We don't have a 24h reception, so you are requested to inform us your approx time of arrival, in order to organize your welcome. Thanks. An incredibly and unforgettable authentic experience just in the medina! We are so happy we booked this amazing riad! Veronica, the owner, has been incredibly responsive since our initial booking, from organizing airport transfers, day excursions, or any special requests we had for our stay. It was actually my birthday on the second day of our trip, and she worked with my boyfriend to coordinate cake, flowers, and decorations to surprise me. I was shocked as I didn't suspect anything! The riad is definitely pretty and well located with lovely rooms and relaxation areas, so really a perfect place to call home when visiting Marrakech! What made the stay special was the personal care and attention we received from the riad staff. They were helpful in setting up everything for us and really taking wonderful care of us. We ate delicious, home cooked meals prepared by Noura and Oussama every night in addition to the daily breakfast starting each day off great! The most hospitable place and the most hospitable people! I am already thinking about when and how to get back! Thank you so much! Home&Breakfast: enjoy the privacy of a private rental without missing the comfort of an on site staff. 5 rooms, a cool patio, a fresh pool, a traditional hammam and a sunny terrace for your exclusive use. Gorgeous breakfast and daily cleanings included. We can also organize happy hours, dinners & parties. The riad will be all for you and will welcome you among its stylish tadelakt walls, inlaid woods decorations, wrought iron, mosaics and traditional motifs, which we have enjoyed decorating with playful colours. You will find 5 rooms, each with private bathroom, a living rooms with fireplace, a patio with a small pool a hammam, and a nice terrace that offers you comfortable sunbeds and a shady pergola. 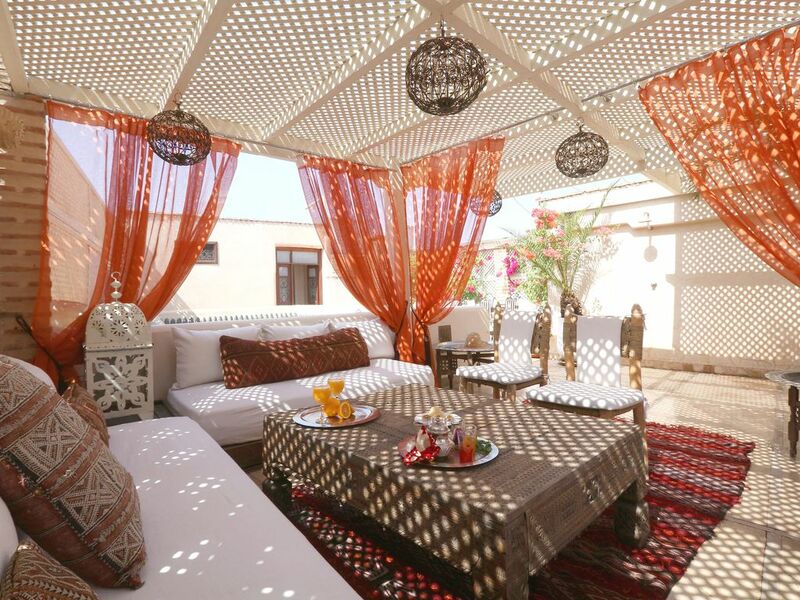 The cool patio, the silent and elegant hub of the riad, is the ideal setting to relax, read a book or make conversation, maybe with Oussama who can give you some tips about what to see during your stay. The pool will be at your disposal if you want to freshen up after a tour in the city, such as the terrace, where you can relax in the sun, drinking a freshly squeezed orange juice, that is waiting to offer you unforgettable evenings. At your disposal, you will also find a hammam, a living room with fireplace, digital TV and free WIFI. During the day Oussama is at your disposal for any information you need and Noura will deal with your breakfast and possible meals. They will always respect your privacy, but they are always there if you need something. Enjoy our tours & activities: customized city guided tours, quad, camel & sidecar rides, hammam and spa, tours to Essaouira, the Atlas, the desert. Come & live an authentic Moroccan experience! L'IVA è incusa nel prezzo. La tassa di soggiorno pari a 23dh a persona a notte non è inclusa nel prezzo. VTA included. The tourist tax of 23dh per person per night is not included in the price. TVA inclut. La taxe de séjour de 23DH par personne et par nuit, n'est pas comprise dans le prix. EXTRA GUESTS: it's TOTALLY forbidden to allow to let in the riad anyone without a regular reservation. In the case this rule will not be observed, ALL the guests have to leave the riad immediately without any refund. CHECK IN: our reception is open from 8.30am to 6pm. If previously agreed with at least 1 day of advance we can welcome guests as follows: from 06pm to 10pm: extra fee of € 15 from 10pm to 01am: extra fee of € 30 We cannot grant not agreed arrival or arrivals after 01am. CHECK OUT: rooms must be left within h. 10.00. Who will leave the rooms after 10.00 will be charged of € 100. If you have special needs just ask us. PRICE: price includes ONLY: room, breakfast and daily cleaning. Any other service has to be considered on request and to be paid separately. BREAKFAST: it's served from 8.30 to 10.00. If you have special needs please ask us and we will do our best to satisfy your request. FOOD AND DRINK: it’s forbidden to bring food or drinks from outside in the riad. We have everything, just ask to Noura and Oussama. SMOKING: the riad is no-smoking. You can smoke only on the terrace. If you don't respect this rule there's an amend of € 100 HENNE TATTOO: indelibly stain towels and sheets etc. In this case, we will be forced to charge the cost of linen: Sheets € 30, pillowcases: € 10 towels: large Middle € 25: € 12, small € 6. FIREPLACE: there are 2 fireplaces in the riad. It is not allowed to light them up by yourself. In the case, ask Oussama, who will do it for you. KITCHEN ACCES: it’s allowed only to take drinks from the cooler. It’s forbidden to use the gaz.